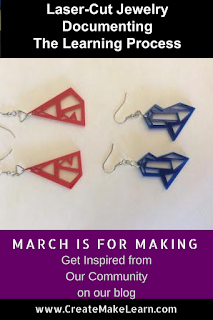 Today's inspiration for the March is for Making Series is (NOT) a piece of jewelry. It's an amazing teacher who is never afraid to explore something new; its a teacher who is not afraid to be vulnerable; its a teacher who not afraid to make mistakes; and mostly it's a teacher who is not afraid to model that learning is a process. I met Melissa Haberman in the late 1990's during a a class I was teaching on HTML for The Web Project. She was willing to jump in to see how technology might be used in art way before most folks! And today she is still willing to jump in to see how technology might be used to teach art. 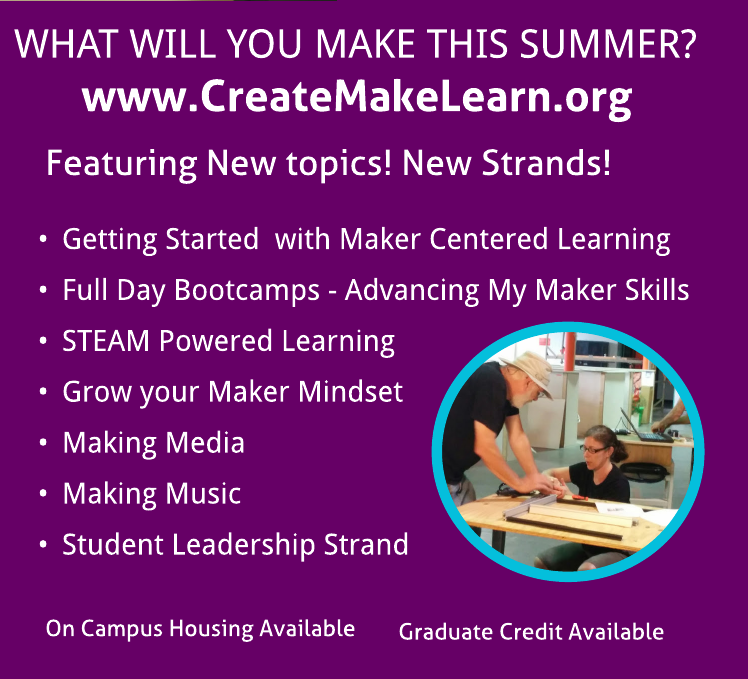 It's no surprise that Melissa has been to all 5 Create Make Learn Summer Institutes. 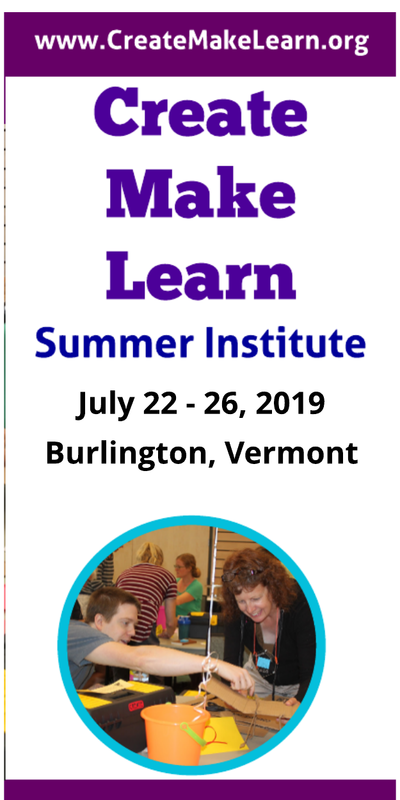 Thank you Melissa for sharing your recent project with us, but mostly thank you for sharing it in a way where we can see your process of learning. Earrings designed using the vector based program called Inkscape. I designed in Inkscape. I used the Draw Benzier Curves and Straight Line Tool to create both of them. My first cut I used 100% speed and 100% power. The earrings did not cut all the way though. Second cut was at 80% speed and 100% power. Almost successful. Some of the smaller holes had to be pushed out with a small tool. The third cut was the most successful. At 70% speed and 100% power I did not have to struggle to push the holes out! 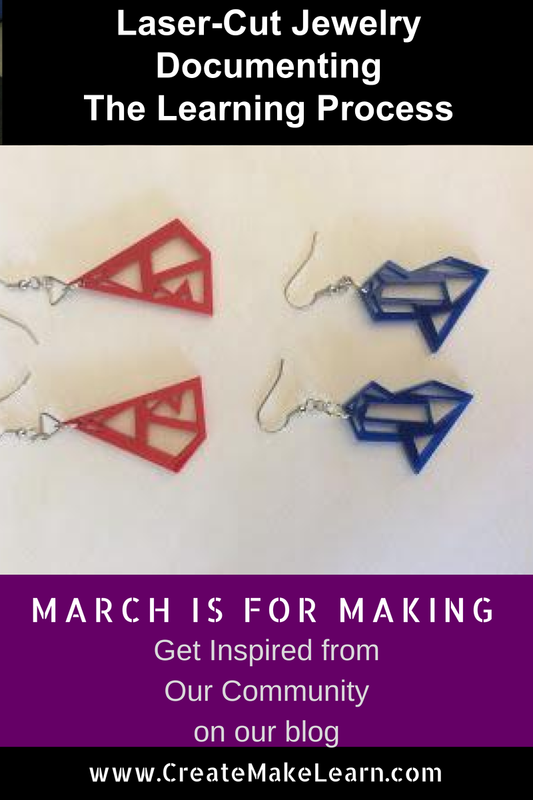 The Earrings were printed on a laser cutter cut on 1/8 inch acrylic. I printed both of my earrings on the laser cutter at St. Albans CIty School. First, I searched for grayscale vector flower drawings that was labled for reuse with modifications. I downloaded the image. I opened the image in Inkscape and and used the circle tool to draw a circle around the image and also inside the flower in the top petal. When I attempted to first print the earring I could not understand how the circle around the flower got cut off. I watched it happen during the vector cut. I deleted that version and a made a second one. This one worked. The laser cutter first did the raster cut of the flower the did the vector cut of the two circles. I had a hard time pealing off the paper from the acrylic so for the second printing I pulled off some of the paper. As you can see from the second set of earring the one on the left had a white haze around the raster cut flower. I took them home and thought to wash them and it took the white haze away!. I also discovered that if I washed the others with the paper on it comes right off. I realize I still need to keep practicing with Inkscape as you can see my circle and flower are not centered.